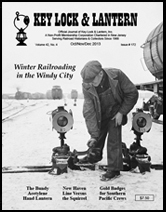 Winter in Chicago: Part 3, C&NW 40th Street Shops, Railroad Locks with Cast Drops, The Maple Leaf Route, In Memory of Bill Lindblom, Reproduction New York Central Globes, Members Display Cabinet, Photos from Along the Line. 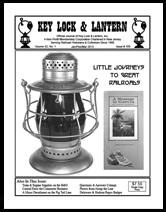 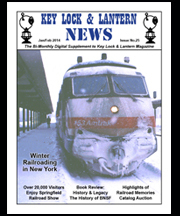 Pere Marquette lecture on lantern signal oil, How Southern Pacific timetables were made, Lock manufacturers of Newark, NJ, The New York Central Gulf Curve wreck, Members Display Cabinet, Photos from Along the Line. 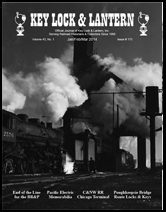 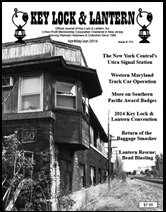 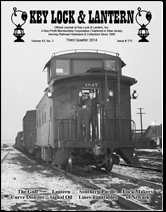 New York Central Utica Signal Station, Western Maryland Track Car Operation, Southern Pacific Badges, Lantern Bead Blasting, 2014 KL&L Convention, Return of the Baggage Smasher, Canadian Pacific Lamp Diagrams, Photos from Along the Line. 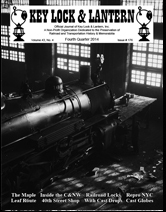 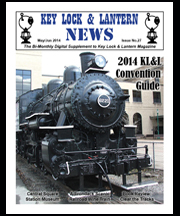 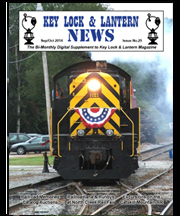 End of the Line for the BR&P, the C&NW in Chicago, Pacific Electric Railway Transfer Tickets, Locks & Keys from the Poughkeepsie Bridge Route, Oil Train Safety on the Erie Railroad, Dietz Catalog Pages, Photos from Along the Line.